Zombies! The living dead. We all get hungry sometimes, but zombies? They go the extra mile. You might’ve (in our privileged society) gone for like a while without eating lately, and maybe you wanted a snack or something, but these dudes are always up on that hunger creep, and they just do not let up for that tasty treat of the flesh of mortal man (or woman, or transgendered folk but I haven’t seen that explored in a zombie movie yet so maybe they’re off the hook) – and even death itself can not put down their insatiable craving for our brains. With modern technology, the incessant desire to vicariously overcome our fear of homogeneity, mortality and futile incompetence in the face of an enormous, uncaring, seemingly unchangeable reality can be indulged in an ever-increasing spiral of books, tv shows, comics, movies and now videogames, and since I too desire to escape the sad reality that we must all one day die (and enjoy seeing the catharsis of characters dealing with the same struggles, plus see a monster getting its skull burned in by acid) – I sometimes dip my toe into a little puddle of these murky, necrotic waters. One of the first videogames that I can remember ever fully dealing with zombies was the videogame Resident Evil (or Biohazard), which one of my friends used to have as a pirate copy for the PlayStation back when I was a kid. Because piracy was far less developed back then than it is now, the disc took about 20 minutes to fire up, all the while a strangely un-nerving eye staring out at the viewer, daring you to press start or X or whatever it was that you’d already pressed five minutes ago and were now hearing the machine desperately strain to read the disc. The game itself was more or less a continuation on the sieged-by-zombies theme of Night of the Living Dead, at the beginning, while also going into a sort of gothic haunted house, mysterious crazy things going on nightmare as the game continued, with enormous, bizarre, freakish monsters as the game strived to explain beyond all measure with insane genetic conspiracy the reason as to why there were some big, vicious dogs outside a house. So, strictly speaking, Resident Evil has never really been a full-on, straightforward humans vs. zombies game, with the zombies almost a side product to the main story of this genetic conspiracy that has created them, indeed the fourth and fifth entries in the franchise focus more on the exploitation of a brutal parasite that allows for smarter, stronger pseudo-zombies (they’re kind of like a rage virus zombie but with mutating limbs and body parts). All this is ultimately to tell you that I love the newer Resident Evil games (although they can be pretty flawed with their attitudes to gender and, a -bit- weird with race) – Resident Evil 4 is essentially perfect as a videogame, Resident Evil 5 is fantastically committed to exploring its B-movie sci-fi roots, right down to its deliciously insane ending, and Resident Evil 6 is what I’m playing lately. 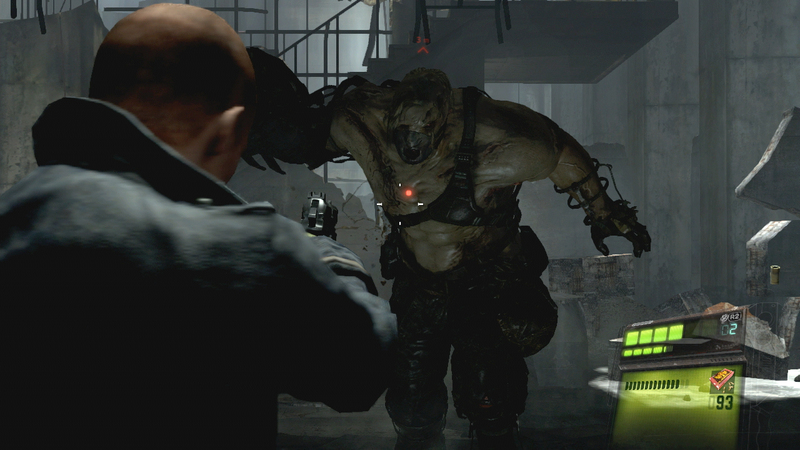 Resident Evil 6 is a tremendously ambitious game, not only because its four complete campaigns all seek to tell roughly the same series of events through different gameplay-styles and different protagonists (each with their own proficiencies, like in a fighting game) – but for the amount of different stories that each campaign is able to wring from those events, and how they interlock and form a complete whole. Plus, giant monsters. I’m mostly counting this as a zombie game because of the zombies that appear in Leon’s campaign, which is victim to a few major problems as it tries to force in a romance story that doesn’t really work at all, since Leon refuses to even passingly mention an important event with regards to that character that is discovered almost immediately prior to meeting her, and various other inconsistencies in the treatment of her are literally hand-waved in the ending as “huh, women, am I right?” — this is just an incredibly poor execution that could have been saved with a few small scenes or even a brief conversation, but is missing from the campaign seemingly only so that the mystery could be prolonged further, which ultimately denies the interactions of any emotional weight (a problem that occurs with another character in Leon’s campaign). Chris and Jake’s campaigns also deal to some degree with mysteries that are kept from the player, but they work much more effectively, perhaps because they are in fact legitimate mysteries to the characters, and not just arbitrarily withheld information. The monster designs are incredible, with some genuinely frightening and others wonderful homages to B-movie sensibilities, the gameplay is great and varied (especially Chris’ campaign) and the story unfurls very well, with lots to enjoy and an improved inventory system from RE5. If you don’t like insane, nonsensical action movies with giant monsters and slightly hammy characters (strangely toned down a notch from Resident Evil 5 – CHRIIIIIIIIS!!!!) then you could easily give it a miss, but I think it really tries to do something different and the scale is amazing. I’m actually not done playing it all the way through yet so I’ll post more as I get through it (I’m currently working through smart-mouthed badass Jake’s campaign, although his cool is somewhat diminished by the amount of times he falls off things or dies when I’m playing as him). The other game I’ve been playing lately is Project Zomboid, by The Indie Stone, available on Desura for £4.99. It’s an isometric zombie survival game with no real plot as of yet (it’s still in alpha) – with the player taking on the role of a sole survivor struggling to find food, shelter and weapons to face the unending horde that threatens to overwhelm you at any time. It’s really impressive and there’s a ton of stuff to do, from finding a hammer, nails and plank to build barricades, a trowel, seeds and watering can to grow crops, or just a shotgun and a baseball bat to go zombie-hunting (with the shotgun obviously attracting way more zombies, but capable of bringing down lots at a time) it’s strangely rewarding to play, with each character you create being essentially lost forever when they die thanks to the game’s auto-saving, but it doesn’t quite feel frustrating as your death is almost always your own fault (usually in my case due to hubris in the face of taking on two zombies with an almost-broken golf club). Before that I was re-playing through Telltale’s The Walking Dead but you already know how good that is (and now I’m re-reading the compendiums, but you already know how good they are). Bye!